This tribute article is for John James Nicholson – a young Protestant man born and raised in Ireland. At the age of 19, he immigrated to Canada to later served in four different police forces in Western Canada. 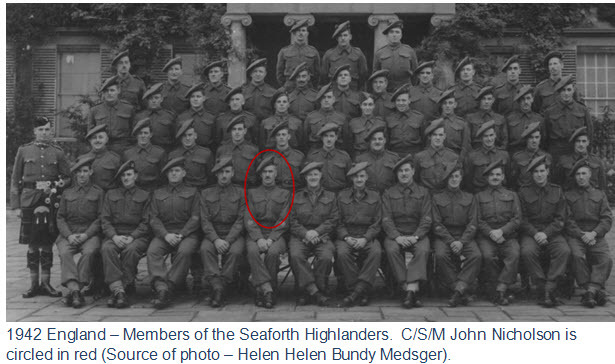 In addition, he also served overseas in World War II as the Corps Sergeant Major in the Seaforth Highlanders Regiment. For this article, historical events have been included to provide a perspective of what situations and circumstances that were faced by John Nicholson. His story provides an insight into the issues surrounding the ‘Prohibition Era’ in Canada. The details, contained within this tribute, were acquired through a wide range of sources: family records, government records, old newspapers, many historical books and RCMP records. 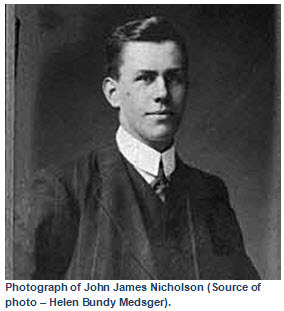 John James Nicholson was born at Westport (County Mayo) Ireland on October 17, 1893. His parents were James and Sophie Nicholson. 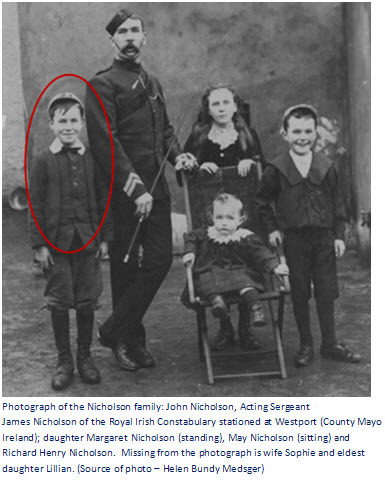 James Nicholson was a member of the Royal Irish Constabulary (RIC) stationed at Westport Ireland and who eventually rose to the rank of acting Sergeant. His father had also served in the RIC as was his wife’s father. As was the policy at the time, RIC members were required to live within the local barracks with their families and were not permitted to be stationed in a County where they had relatives. This policy was required to avoid family influences and to instill an esprit de corps amongst the members of this para-military force. Consequently, John Nicholson and his family became quite familiar with the para-military structure and routines. His siblings were Richard Henry Nicholson (1 year younger), Lillian Nicholson (oldest sister), Margaret Nicholson and May Nicholson. 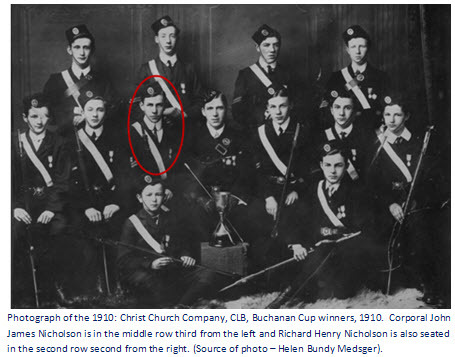 As the sons of a RIC member, John and Richard Nicholson joined various social groups which would hopefully lead to a future career in the RIC or in the British military. With the disbanding of the RIC in County Mayo in 1909, James Nicholson moved to County Donegal Ireland in 1910 with his family. He was able to secure a position as a postal inspector and station master for the area. With the reduced likelihood of becoming an RIC member, the two young Nicholson men considered other job opportunities. After completing his schooling, John was able to secure a job working in a local law office. While his brother Richard obtained a driver position at a location automotive dealership. In September 1905, Saskatchewan and Alberta each became a province in the Canadian federation. To support the immigration and population growth for the prairies, the Canadian government printed pamphlets in 12 different languages. These pamphlets were designed to promote western Canada as a land of productive soil, adequate rainfall, a land of prosperity and happiness. The terms of “cold” and “snow” were noticeably absent on the pamphlets and more descriptive terms were used such as “invigorating.” For this immigration initiative, the Canadian government banned the distribution of prairie temperatures outside of Canada and all government documents were void of references of cold and snow. Each Canadian Embassy coordinated the distribution of these pamphlets to farmers and tradesmen in many countries in the United States, Great Britain as well as western and eastern European countries. In addition, pamphlets were also sent to many libraries, reading rooms, and schools as well as being posted on notice boards. Based on the distribution of these pamphlets, the population in Saskatchewan increased from 194,000 in 1904 to 278,179 in 1914. With the establishment of the province of Saskatchewan, the Canadian government contracted with the province to have the RNWMP perform the provincial policing duties. For this contracted service, the province paid the federal government a sum of $75,000 per year. From the province’s perspective this was a good deal because the collection of annual fines and fees would easily cover these RNWMP costs. Clearly, the federal government was heavily subsidizing the provincial policing costs as the actual costs were well over $225,000 annually. 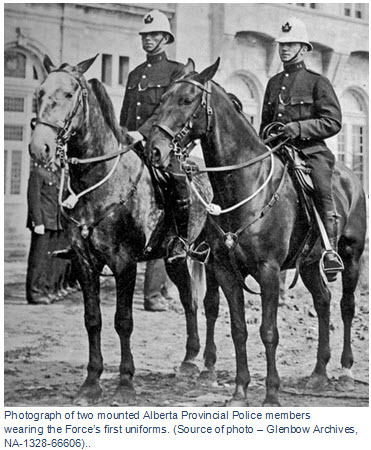 In 1905, the RNWMP had 250 members to police Saskatchewan and this number would eventually increase to 362 by 1916. To appease the prohibitionist, the Saskatchewan government established a liquor enforcement policing group called the “Secret Service.” In 1911, Ex-Ontario Provincial Police member Charles Mahoney was hired to head this new enforcement team. The primary responsibility of this team was to enforce the provincial legislation which included the unpopular Liquor Act. Based on the Canadian government’s pamphlet program, John Nicholson’s distant cousin, Sam Edwards decided to immigrate to Saskatchewan and established a farm homestead between Outlook and Bounty. Subsequently, John’s eldest sister, Lillian, and her husband, William Allen, ventured forth to be the frirst of the Nicholson family to immigrate to Canada. With hopes of adventure, John convinced his sister and brother-in-law to sponsor him to Saskatchewan as a farm labourer. In March 1912, John arrived in Canada and caught the train to Saskatchewan and settled in with the Edwards family west of Outlook Saskatchewan. In less than a year, John came to the realization that farm labour work was too demanding and the weather conditions were too extreme. Consequently, he drifted south and settled in Moose Jaw Saskatchewan where he secured a position as a streetcar conductor. 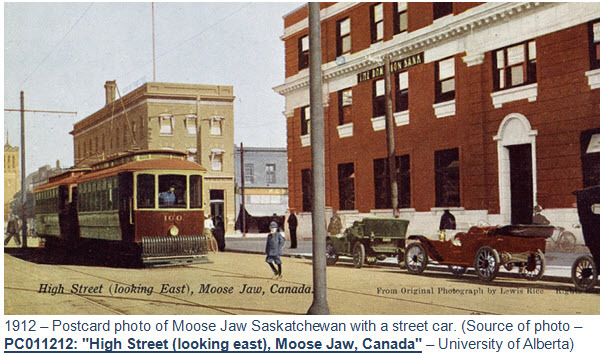 While in Moose Jaw, John wrote to his younger brother and convinced him to also immigrate to Saskatchewan. Richard arrived in the spring of 1913. Both brothers contemplated job opportunities that provided both travel and adventure. 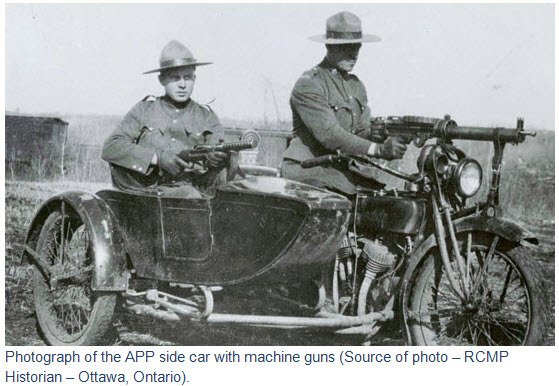 It was in Moose Jaw, they both decided to join the Royal Northwest Mounted Police (RNWMP). Both brothers caught the train to Regina and made their way to the RNWMP barracks which was situated on the western side of the city. It was at the RNWMP barracks that they each submitted their application to join the Force. Much to their surprise, both were accepted into the Force. However, Richard was deferred for two months until his birthday. John was engaged in the Force (Reg. # 5562) on April 26, 1913 and June 17, 1913 for his brother Richard (Reg. #5611). The para-military training provided at the RNWMP “Depot” Division was familiar to both Nicholson brothers because “Depot” was modeled after the training facilities of the RIC at Phoenix Park, Dublin. As young boys, they would watch the RIC being drilled every morning at their father’s RIC barracks in County Mayo. John Nicholson completed the six weeks of basic training at “Depot” and was transferred to Saskatchewan. Over the next three years, he was posted at several detachments: Lanigan, Punnichy and Elbow. After one year of service, John was promoted to the rank of Corporal. The lack of willingness of RNWMP members to enforce the Saskatchewan Liquor Act continued into 1915. At North Battleford, the RNWMP Constables refused to enforce the Liquor Act. Staff Sergeant William Loggin (Reg. #2471) at Melfort also refused to enforce the Act. The increasing reluctance was brought to the attention of the Saskatchewan Solicitor General who was assured by Commissioner Bowen Perry that the RNWMP would to enforce the provincial Liquor Act. Prior to leaving Ireland, John met Kathleen Ellen Allen in Donegal and they were engaged. Kathleen was a member of the Protestant ‘landed gentry’ back in Ireland and grew up living with her maternal grandparents at the family estate, Mulaney, in County Donegal. Upon departing Ireland in 1912, John promised to secure a position in Canada and would summons Kathleen when it was time to marry. Kathleen patiently waited four years to receive John’s approval to immigrate. While waiting, she attended and graduated from the Nursing School in Belfast. 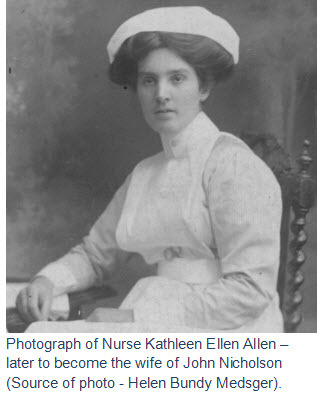 However, Kathleen decided not to continue nursing as she didn’t have the stomach for hospital work. Photograph of the RNWMP Rules and Regulation (Source of photo – Sheldon Boles). At this time in the Force, married members were strongly discouraged. For example, The RNWMP’s Rules & Regulation paragraph 1274 stated “Married men are not eligible for engagement.” For the Force, it was easier to transfer and control or mold a single member as opposed to a married member whose loyalties would be distracted from the Force. In all likelihood John submitted his application for marriage and it was rejected. With John’s three year term coming to an end on May 2, 1916, he chose not to re-engage and instead sought employment elsewhere. In the spring of 1916, John sent for Kathleen and she boarded a ship for Canada. The ship’s log outlined a question asked of Kathleen – “What is your intention on coming to Canada?” Her response was “To marry J.J. Nicholson, Mounted Police.” She arrived in Regina on May 21, 1916 and was met by John. They were married six days later on May 27, 1916 at the Knox Church in Regina, Saskatchewan. A few days later, John was sworn into the Saskatchewan Secret Service as an acting Administrative Sergeant and worked out of the basement of the Saskatchewan Legislature building. His pay at the time was $100 per month. At the time, the Secret Service had no uniforms and worked in plain clothes. “The pressure from the ‘bannish the bar’ zealots became so strong that by December 11, 1916 a year after the liquor dispensaries were closed, a vote was taken to determine whether Saskatchewan wanted Prohibition. The voters left no doubt in anyone’s mind. By an overwhelming mandate of 95,249 to 23,666 they voted out the liquor dispensaries and opted for Prohibition.” The Temperance Act can into effect in Saskatchewan on January 1, 1917. Faced with a national priority of protecting the Canadian border, the Prime Minister sought the consent from Premiers of Alberta, Manitoba and Saskatchewan to an early termination of the RNWMP provincial policing agreement on November 10, 1916. All provincial Premiers agreed to the early termination. As such, each province was obligated to create their own provincial police force. With this short notice, Saskatchewan Premier Meville Martin immediately directed Charles Mahoney, under the authority of the Constable Act of 1906, to create a Saskatchewan Provincial Police (SPP) force to replace the 362 RNWMP positions being removed from provincial policing duties on January 1, 1917. Upon receiving this authorization, Charles Mahoney set out to recruit and hire new provincial police members. At the time, there was a shortage of qualified men because many men were applying for or serving in World War I. “By January 1, 1917, the new provincial police force ‘could hardly be called anything more than a group of vigilantes or civilian police.” The SPP initially operated with no uniforms. 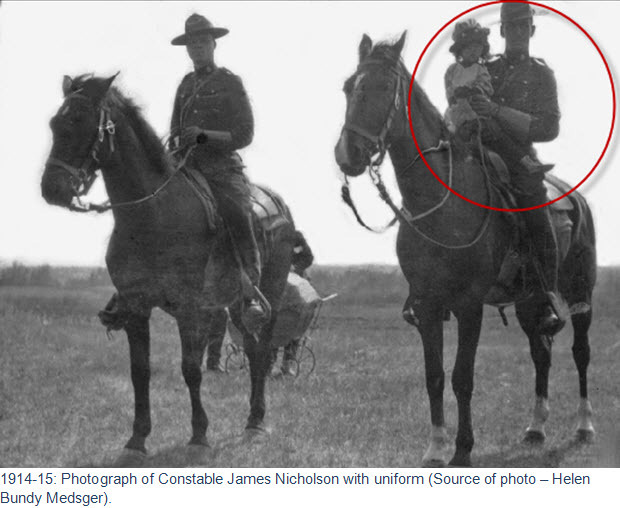 The task of designing the uniform was left to Inspector Tom Goldsmith (ex-RNWMP member – Reg. #3980). Since Tom was a veteran of the South African War and the RNWMP, he selected a distinctive uniform: “uniforms of khaki breeches and tunics, to be worn with brown boots and leggings. Head gear, which was soon to become as familiar as the ‘Mountie hats, was a Stetson hat, worn Australian style, with the brim curled up on the left side. Sam browne belt, with holster on the left side, completed the uniform.” Each SPP member was personally issued with a wallet badge for use when wearing plain clothes. 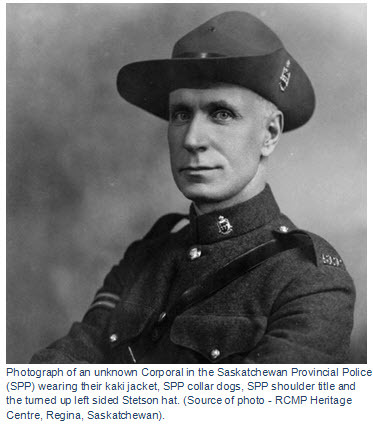 For John Nicholson, the new SPP uniform was a slight variation of the RNWMP uniform which he had become accustom to in the Force. With the establishment of the SPP, they created four Divisions within the province: Weyburn, Regina, Prince Albert, and Saskatoon. Within all regions, a total of 45 detachments were opened. 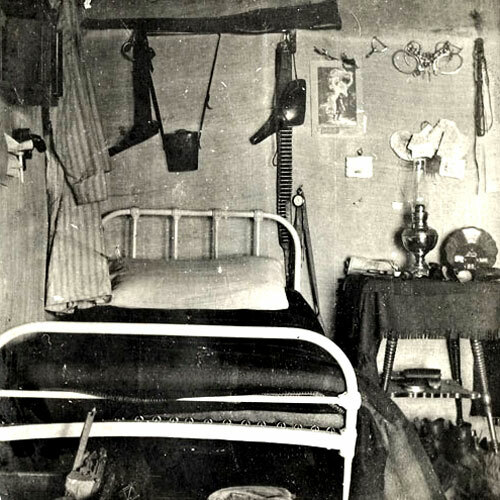 Many of the early Detachments were mere shacks or rooms rented in private homes. With this transfer, his pay was reduced from $100.00 to $91.00 per month. After complaining about the pay, John received a pay raise in June 1917 to $100 per month. It was only in November 1917 that he was promoted to Corporal. For most of the time John was stationed at Moose Jaw, he worked by himself. Despite the lack of staff, he was also tasked with providing orientation and training for new SPP members on how to run a Detachment and how to submit their monthly diary submissions to the Regina Headquarters. In 1917, he was involved in the arrest of Mr. D. W. Hines who was “one of those fabulous characters that show up on the public scene every generation or so. One of his early ventures was the promotion of a farmer-owned railway and shares were issued on the basis of work donated on the construction. When the province imposed stricter liquor laws, ‘Farmer’ Hines leaped to the challenge on behalf of the ‘little man.’ He had a volume of white ribbons imprinted with the slogan ‘Friends of Farmer Hines’ and sold these for one dollar each. Holders of the ribbons were then given free beer! Despite the lack of staff and the expectation to work 24 hours a day 7 days a week, Officer in Charge of Regina Division outlined to John that “he could not run the detachment and that unless the diaries were sent in there would be something doing and was later told by the same officer – you’re excuse of not having time and enough assistance was not good enough.” Each member of the SPP were expected to maintain daily diaries of their activities. At the end of each month, each Detachment Commander was required to submit a report of their daily activities. From all the submitted Detachment diaries, the Officer Commanding the Subdivision would submit his monthly report to SSP Commissioner’s Office. This new life in Canada was extremely difficult for Kathleen. With John gone most of the day, she was left at home to ponder her future life and coping with the harsh winters and hot summers. In all likelihood, Kathleen probably missed the established and privileged life she enjoyed back in Ireland. After considering the working conditions at Moose Jaw and the lack of support from his superiors, John Nicholson concluded that he was not being compensated for his work nor appreciated for his efforts. As such, he resigned from the SPP and applied for a position with the Alberta Provincial Police. After leaving the SPP and for the next 10 years, the SPP were pledged with allegations of political interference in police investigations. In 1931, the Saskatchewan government commenced negotiations with the RNWMP to take over the provincial policing in Saskatchewan. 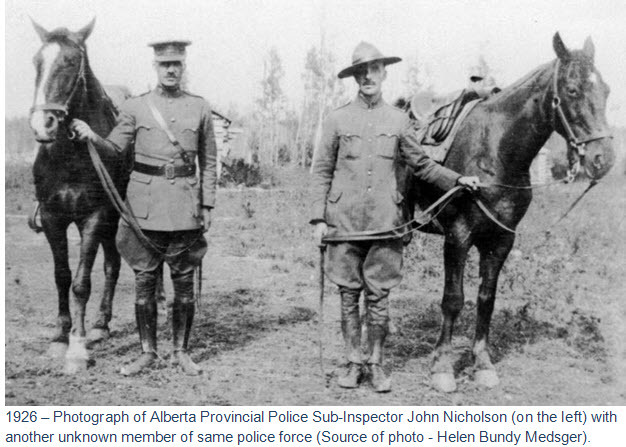 On June 1, 1928, the RCMP took over the provincial policing in Saskatchewan. As such, the SPP was disbanded. The Force agreed to accept the SPP members into the RCMP provided they applied. To accommodate 53 SPP members willing to convert into the RCMP, the Force waived the marriage restrictions. Of this 53, 10 were former members of the Force. For the SPP members who didn’t wish a pay cut (from $140 per month to $68 per month) to join the RCMP, they joined either the Manitoba Provincial Police or the Alberta Provincial Police. The Alberta government was less then pleased with the announcement in November 1916 that the province had to create their own provincial police force. Prior to the announcement, they were paying only $75,000 each year for the RNWMP to provide 250 members and performed all the duties of their provincial police force. In the following year, the province of Alberta estimated their cost for creating and maintaining their own provincial police force was at least $300,000 each year. Due to the short notice of termination, the Alberta government sought and received a three month extension on the withdrawal of the RNWMP members. 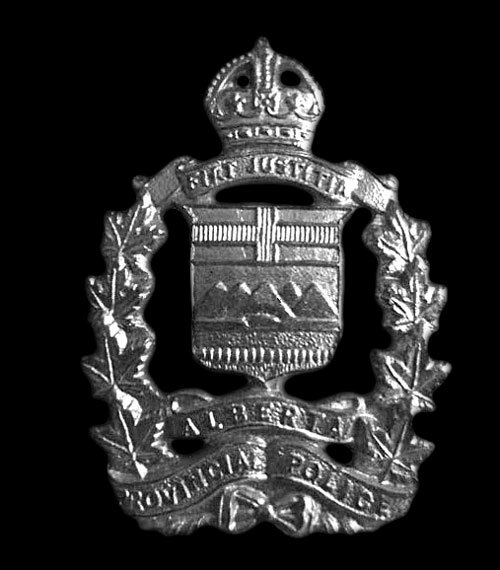 Legislation for the creation of the new Alberta Provincial Police (APP) force was proclaimed on April 5, 1918. – less of an emphasis on strict discipline. The previous experience of these ex-RNWMP members was invaluable in the establishment of this new police force. By the end of 1918, the APP had a total of 74 members in their APP. However, these uniforms were found to be totally unacceptable for patrolling remote locations on horseback. Since most of the new APP were ex-RNWMP members, they felt that these uniforms were similar to that of a night watchman. With complaints and suggestions received, the APP uniform was eventually changed to a ‘Mountie-similar’ uniform: Stetson hat; a khaki uniform jacket was used for daily duties; and a blue serge for attending court. APP also had their own unique police crest. 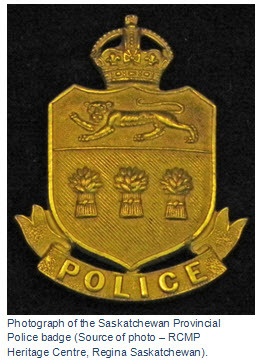 Photograph of the Alberta Provincial Police crest (Source of photo – Sheldon Boles). Many of the APP organizational structures and policies were developed on the RNWMP model because a large percentage of the APP members had previously been in the RNWMP. After being sworn in and fitted with his new uniform, John Nicholson was transferred to Vegreville Detachment (“A” Division) via train from Edmonton. Once he established his family in Vegreville, John Nicholson quickly embraced his new duties as the APP member in the area. His primary focus seemed to be aggressively enforcing the Alberta Liquor Act and the Prohibition Act of Alberta. As in most areas of Canada during the Prohibition era, the opinions of ‘liquor prohibition’ were divided between the rural and urban residents. The urban residents were in favour of the prohibition while most rural residents were not. By July 1918, Constable John Nicholson had established a reputation for himself as an ‘aggressive’ enforcer of liquor prohibition. Consequently, his actions were not supported my many rural folk. As such, a 200-300 person signed petition was being circulated in the urban and rural areas of Vegreville. The petition called for John’s immediate transfer. Upon hearing of this petition, several community leaders informed the APP headquarters in Edmonton. Inspector D. Fisher was delegated to conduct an investigation. Fisher’s investigation included: interviewing various individuals; taking statements and submitting his final report to the APP Commissioner. The investigation discovered that the noted petition had been encouraged by Staff Sergeant Matthew Fyffe (Reg. #2850) of the RNWMP. Fyffe had previously been stationed at the RNWMP Detachment in Vegreville and still had family in the area. On September 21, 1919, Fyffe would retire from the Force and would later become an Inspector in the Alberta Provincial Police. On March 1, 1919, John Nicholson was promoted to Corporal and his pay increased to $3.30 per day. Then on June 27, 1919, he was promoted to Headquarters Sergeant and transferred to Lethbridge (“D” Division). 1922 – Photograph of Emilio Picariello. During the same time, Emilio Picariello moved his criminal enterprise to Blairmore Alberta and bought the Blairmore Hotel from which he based his bootlegging from Fernie BC into Alberta. Picariello was commonly referred to as the “Italian Robin Hood” as he frequently shared his crime profits with the less fortunate. According to Helen Bundy Medsger – “I believe my granny had a difficult time transitioning to being a policeman’s wife. The weather on the prairies, constant reassignment resulting in each of her four children being born at different stations and having to re-establish a household nearly every year, John being gone for extended periods and, given the dangers of dealing with policing prohibition and the coal miners’ strikes, the fear of his being murdered. In September 1922, Picariello and a criminal colleague were involved in a confrontation with APP Constable Stephen Lawson. During the struggle, Constable Lawson was fatally killed. Both suspects were arrested the following day without incident. The Provincial Attorney-General John Brownlee attended every day of the murder trial. Picariello was found guilty of the murder of Constable Lawson and was subsequently hung in 1923 at Fort Saskatchewan. By the spring of 1922, the APP received approval to increase their establishment by 50 officers with Mr. E.S. Bishop being appointed the Commissioner under the Liquor Act. Mr. Bishop was to have control of the administrative functions while John Nicholson remained in charge of the police activities and was promoted to Inspector on March 1, 1922. “When November 5 (1923) rolled around and the vote was tabulated, the majority in favour of taking liquor out of the hands of the bootleggers and rumrunners and placing distribution in the hands of the government was 23, 2110. In compliance with the wishes of the majority, the government proceeded to draw up amendments to the Liquor Act which would provide for the establishment of an Alberta Liquor Control Board, the readmission of liquor for consumption in private residences, in bona fide clubs for members only, and in parlours in those places where special premises had been set aside from the dining area. On May 10, 1924 with the proclamation of the revisions to the Alberta Liquor Act, the liquor prohibition in Alberta came to an end. With the end of the liquor prohibition, John Nicholson requested and received a demotion to the rank of Sub-Inspector so that he could be placed in an operational field position. 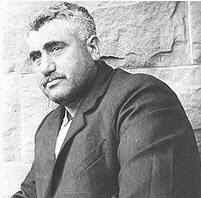 On June 8, 1924, he was transferred to Drumheller to oversee union problems with the local coal miners. of the Peace River District. An editorial appeared in the Albertan newspaper on October 2, 1925 “Inspector Nicholson came to Drumheller over a year ago, and through his firm but fair conduct of his duties, of his position and his clean personality, he won the respect and admiration of all classes of citizens. He came to Drumheller when the reputation of the force was not of the best and when , as many have said, “Anything was supported to be alright in the Drumheller district . His had the task of re-creating confidence in his own force, and the proper respect for law and order, and the splendid manner in which he accomplished his task is best found out when speaking to the better class of citizens. On July 1, 1928, John received his last promotion back to the rank of a full Inspector. In the same year, the province of Alberta and the federal government commenced discussions about the possibilities of the RCMP replacing the APP. Consequently, the morale within the provincial police became a major concern with all members of the APP. However, Commissioner Willoughby Bryan (ex-RNWMP Sergeant Major with Reg. #2152) continually defended his police force and repeatedly outlined that he had no desire to re-join the RCMP. Shortly after December 26, 1928, John was advised that his younger brother – Sergeant Richard Nicholson (RCMP) had been killed in Manitoba by a moonshiner over a struggle for a rifle. Check out the Sgt. Richard Nicholson story. In 1931, the Canadian Depression was having a significant impact on the province of Alberta. Their revenues had continued to decline commencing in 1929. Faced with a limited provincial revenue, the provincial government of Alberta entered discussions with the federal government on the possibilities of the RCMP taking over the provincial policing duties. The official takeover by the RCMP was on April 1, 1932. Prior to the takeover, 80% of the APP members were ex-RCMP members. At the time the APP were absorbed by the RCMP, the APP Constables were receiving $130 per month while the RCMP Constables were only receiving $68 per month. To encourage the APP members to convert to the RCMP, many APP members were promised promotions to the rank of Sergeant. Only 143 APP members were accepted into the RCMP. In so doing, the marriage restrictions were waived for their entrance into the RCMP. After leaving the APP, John Nicholson secured a position as an insurance investigator. In 1929, he started to work in Edmonton and later ended up in Calgary. In 1930, John brought his family to Vancouver British Columbia where he applied for and was accepted into the Vancouver Police Department. From 1930 to 1939, he rose to the rank of Detective Sergeant. Their first home was a duplex on Guelph Street in Vancouver. 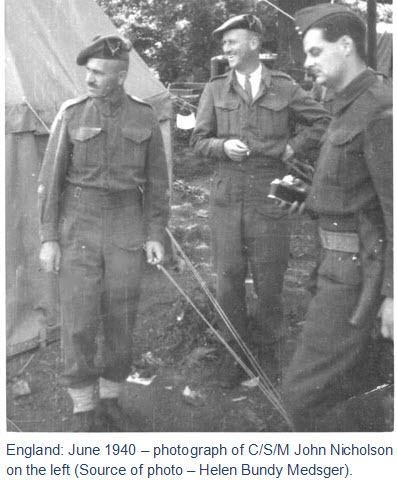 On September 1, 1939 and nine days before the Canadian government declared war on Germany, the Seaforth Highlanders Regiment were ordered to mobilize. With this mobilization, John resigned from the Vancouver Police Department. In just one week, the regiment recruited up to its full war-time strength. 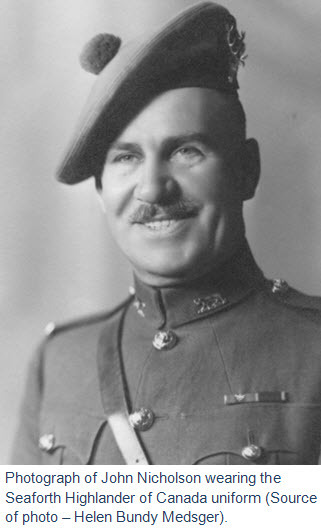 With the rapid increase in establishment in the Regiment, John Nicholson was promoted to the Regiment’s Corps Sergeant Major (WO II) in October 1939 and two years later promoted to Corps Sergeant Major (WO-1). In December 20, 1939, John Nicholson and his Regiment were on board the “His Majesty’s Troopship (HMT) Andes” departing the Halifax harbor for Scotland. After the disaster of the Dunkirk Raids, the Seaforth Highlanders were one of the few fully equipped regiments in England. During the Battle of Britain, the Seaforth Highlanders provided support roles as: manning anti-air batteries; providing parachute defence and frontline coastal defences. In July 1943, the Regiment was deployed to Italy and participated in the invasion of Sicily and advanced into Italy’s mainland. Apparently, John Nicholson wasn’t deployed to Italy because he was over the age limit for combat by two years. He remained in England in a training capacity. 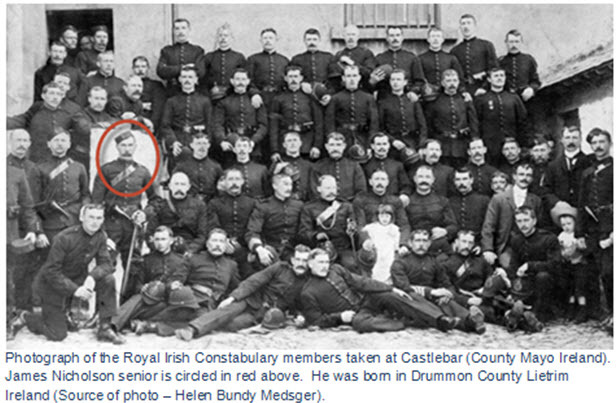 During the later stages of the war, John was shifted from training of troops to various policing duties in England. 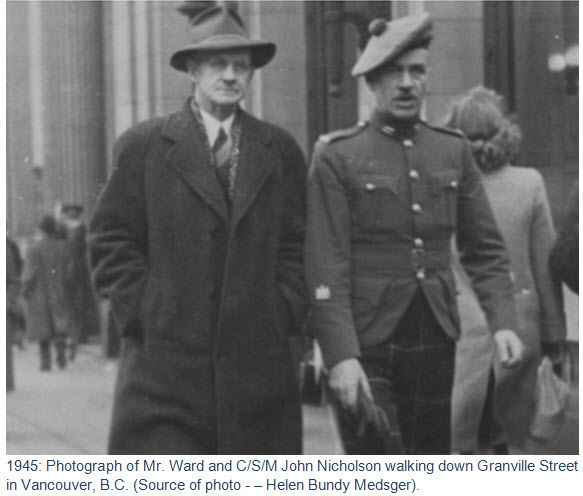 On Sunday October 7, 1945, John Nicholson returned to Vancouver with the Seaforth Highlanders Regiment. The entire Regiment paraded six abreast along Granville, Georgia and Burrard Streets led by the Regiment’s Pipe and Drum Band. It was estimated that 100,000 people turned out to line the streets and wave flags to welcome home their Vancouver heroes. After returning to Vancouver, he chose not to return to the Vancouver Police Department and secured a civilian investigator position with the Canadian Department of Defense. His work including housing inspections for low-income projects. In 1952, John and Kathleen moved to San Mateo California to be near his eldest daughter and her family. While there in California, John secured a security guard position with the United Airlines’ San Francisco Operational Maintenance Branch. In February 1957, John’s 4 year old granddaughter Therese was tragically killed in an automobile accident. This death was a severe blow to John as Therese and he were inseparable. Then suddenly on June 13, 1957, John Nicholson passed away at the Stanford University Hospital. John’s eldest daughter Lillian believed that he died because of a ‘broken heart’ with the untimely passing of his granddaughter. This tribute outlines John Nicholson’s contribution to policing in Western Canada and while at the same time being a devoted husband, father and grandfather. His family is extremely proud of his contributions. Osipoff, Fred – “The S.P.P. 1910 – 28” – The Canadian Journal of Arms Collection (Volume 4 No. 1 – February 1966) – (page 5). Anderson, Frank W. – “Saskatchewan Provincial Police” – Frontier Book No. 28 (1972) – (page 11). Rules & Regulations of the Royal Northwest Mounted Police (1916) – Paragraph 1275. 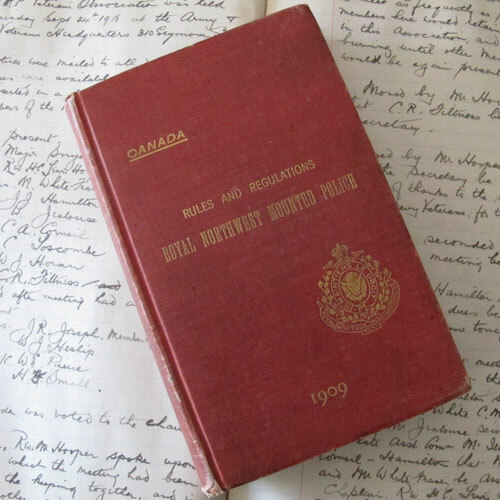 Rules & Regulations of the Royal Northwest Mounted Police (1916) – Paragraph 1274. Osipoff, Fred – “The S.P.P. 1910 – 28” – The Canadian Journal of Arms Collection (Volume 4 No. 1 – February 1966) – (page 6). 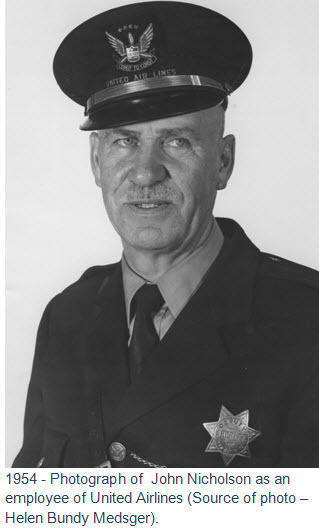 Alberta Provincial Police Archives – “Personnel File of Inspector John J. Nicholson. Winnipeg Free Press newspaper – January 26, 1918 edition. Moir, Sean Innes – “The Alberta Provincial Police, 1917 – 1932” – University of Alberta (Master of Arts Thesis) (1992) – (page 123). 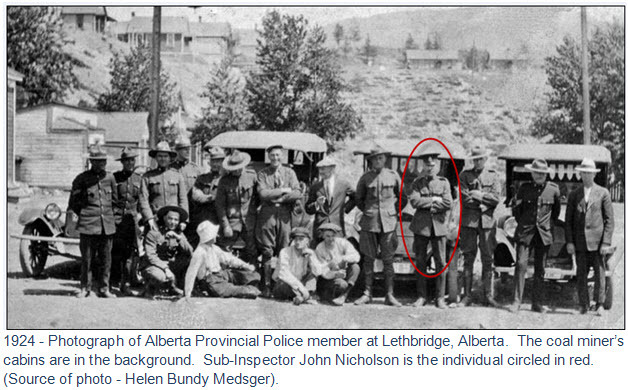 Alberta Provincial Police Personnel File for John J. Nicholson. Anderson, Frank W. – “The Rumrunners: Dodging The Law During Prohibition” – Folk Pubications (2004) (page 99). Anderson, Frank W. – “The Rumrunners: Dodging The Law During Prohibition” – Folk Pubications (2004) (page 100). Anderson, Frank W. – “The Rumrunners: Dodging The Law During Prohibition” – Folk Pubications (2004) (page 112). Anderson, Frank W. – “The Rumrunners: Dodging The Law During Prohibition” – Folk Pubications (2004) (page 116). Alberta Provincial Police Personnel file on Inspector John Nicholson. 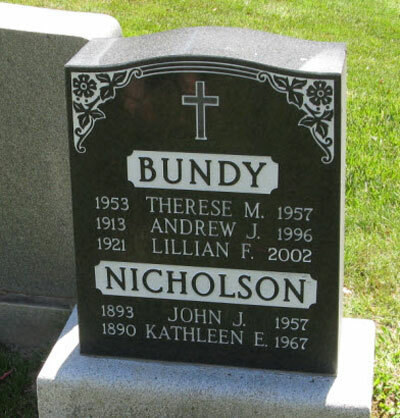 Nicholson Banner, Maureen (youngest daughter of John Nicholson) outlined in an interview on July 15, 2013.